Thai Garden Resort Hotel Manager Danilo Becker (left) and Kalayanee, representing Go Vacation Thailand, proudly display Thai Garden Resort’s “Top Hotel Partner 2017” award from Schauinsland Travel in Germany. The Thai Garden Resort was awarded “Top Hotel Partner 2017” from Schauinsland Travel in Germany. This was the second straight year the resort has been presented this award. 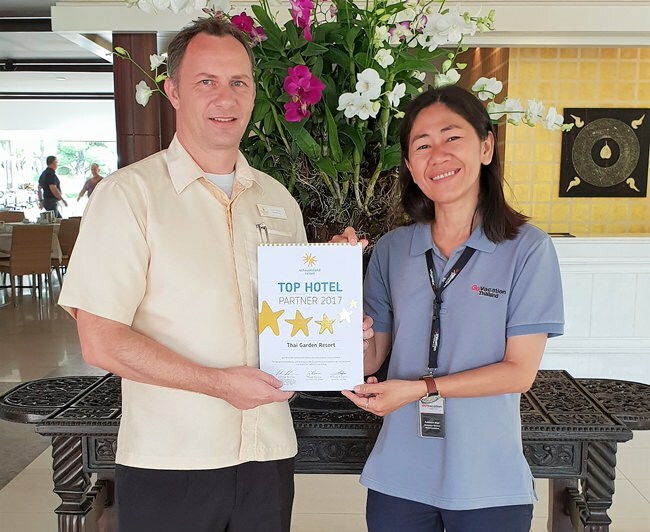 The award certifies that the Thai Garden Resort is among the most popular hotels in the world featured by this Travel Agent. Schauinsland Travel was founded in 1918 in the German city of Duisburg. It is a midsized company and still operates as a family business. It is presently ranked as the 7th largest Travel Agency in Germany. This prize was awarded to the Thai Garden Resort for their loyalty, fairness and flexibility between both companies and reflects the high response of positive hotel reviews by our guests over the years. We would like to thank all of our guests and team members, because without their support it would not be possible to achieve such a prestigious award.